Ah, Galápagos. The Enchanted Isles. A Galapagos penguin checking out what lens I’m using. For the underwater photographer, the Galápagos is indeed an enchanted place. The ocean currents that merge here bring a stunning assortment of large ocean creatures, including hammerhead sharks, whale sharks, manta rays, and sometimes even whales and orcas. Sea lions, seals, turtles are resident, along with unique creatures like the Galápagos penguin and Galápagos marine iguana. 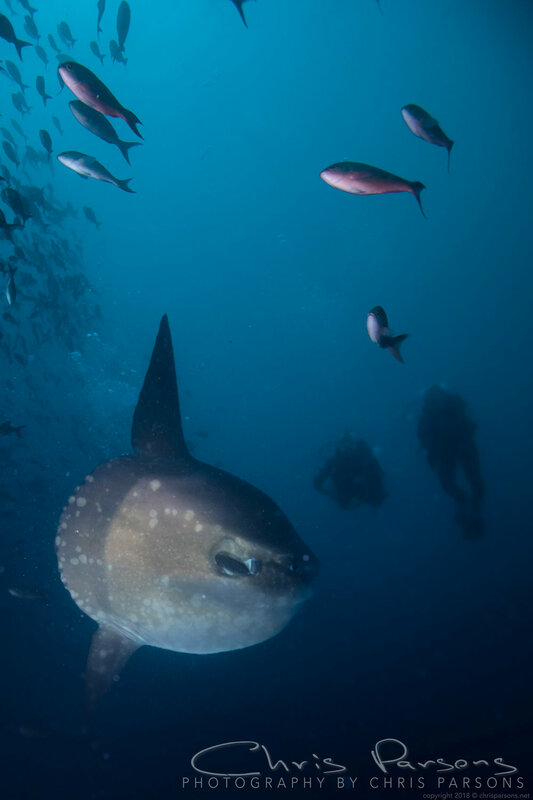 A lucky u/w photographer might also get to capture a glimpse (or a photo) of a mola mola. There may be no better place to see large ocean creatures than the Galápagos. 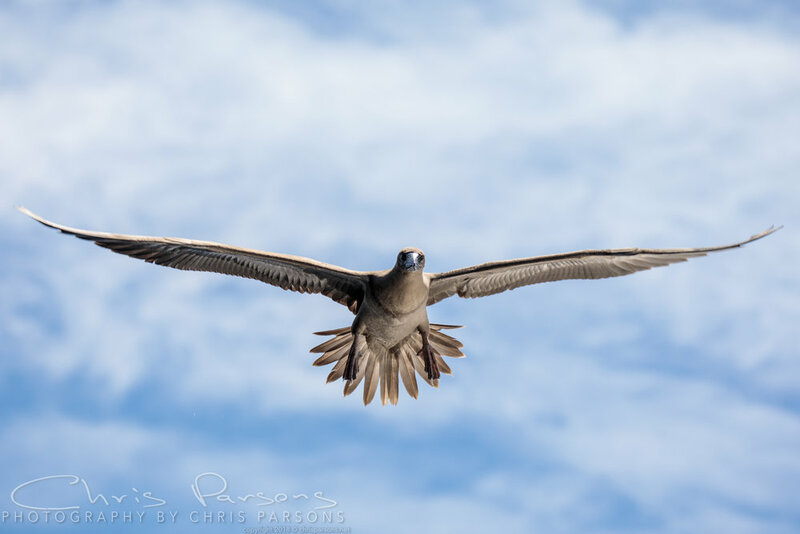 While there are many strategies one could take as a photographer for visiting Galápagos, thinking about what lenses to take is a key starting point. For underwater shooting, a wide angle lens is key. A fisheye lens will definitely get some use, but also consider bringing a wide angle rectilinear lens. This will give you a little more reach for those shy hammerheads. We typically are not going to shoot much macro here, but if you have room for it, a single macro lens will be useful for a night dive or if you just want to shoot some small stuff on a dive or two. And this is why we bring a fisheye. 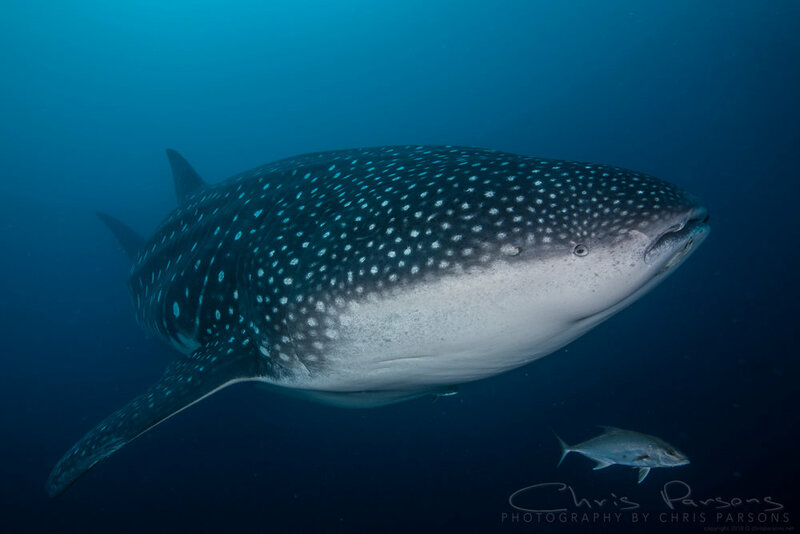 Whale shark, about 40ft long. There are, of course, many more options for these and other cameras. Interested in going to Galápagos this year on a trip designed specifically for u/w photographers? I have a few spaces left for my Dec 1 2019 trip. Contact me here. And finally, the Mola Mola…. Ready to dive the Galapagos Islands? Ready to see an incredible assortment of underwater and terrestrial life, up close and personal? Ready to see the islands that inspired the most profound theory of life on this planet? Our group looks for birds and penguins at the base of the iconic Pinnacle Rock. Join me for an amazing trip to the enchanted Galapagos Islands, aboard the finest live-aboard dive boat in the area, the Galapagos Sky. The Galapagos Sky captains and crew have diving in Galapagos figured out. This is an ideal itinerary, with lots of time at Darwin and Wolf Islands, but also with stops to see things like the marine iguanas, penguins, and mola mola, as well as some shore excursions. A pair of silky sharks hanging out near the Galapagos Sky. This will be my 3rd trip to Galapagos, and I am so excited to be going back. I don't think there is a more exciting place to dive in the entire world. Each day we'll have an opportunity to look at your images and talk about technique and ideas for the next day. I can spend as much time or as little with you; I want to help you get the most of your trip, including capturing the best possible photos or video. Finishing up a dive at the incredible Darwin's Arch. This may be the single best dive site in the world, and the topside scenery is just incredible. Mrs. Whaleshark. She's about as big as a school bus. From whalesharks to hammerheads, sea lions to penguins, mantas to mola molas, the big animal opportunities are endless. 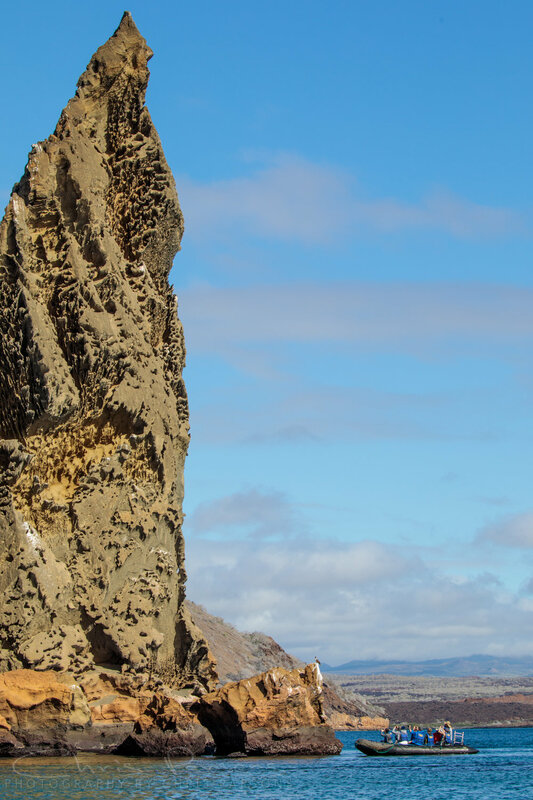 The scenery in Galapagos is spectacular in it's own right. I could write about this for days, but you've heard about this magical place, so let's get into some details about the trip. Our group getting some bird info from one of the on-board naturalists. The sea lions are so much fun; they are constantly playing with the divers and checking us out. Here a sweet little female strikes a decidedly dainty pose for the camera. Travel to the islands is very easy. You'll fly into Quito or Guayaquil, Ecuador, and overnight there. We'll book your short flight from there to Galapagos, and we'll have our own concierge meet us at the airport to make the hop to Galapagos easy. If you want to stay on in Galapagos for a land based week, no problem, we can help arrange that for you. Green turtle out in the blue near Darwin Island. I have a lot more info with many details about travel, the diving, payment schedules, the boat, the itinerary, the marine park, gear needed, and more. Let me know if you are interested and I will get it to you asap. The famous Galapagos marine iguanas have adapted to eating the algae that grows on rocks near shore. Deluxe cabins are $6395 per person. Master cabins are $6595 per person. Both cabin types are double occupancy with private bathroom. Deluxe cabins are located on the lower deck of the yacht; Master cabins on the upper deck. Deluxe cabins have 2 single beds; Master cabins have the option of 2 single beds or 1 larger bed. Hammerheads cruising over the reef. 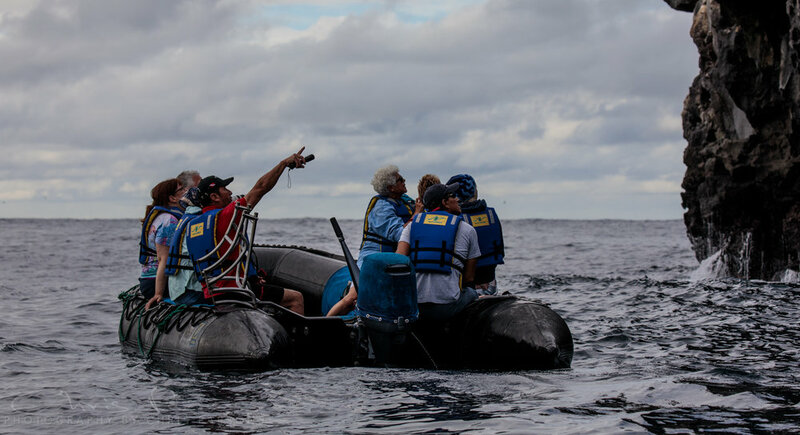 Rates include: Cabin accommodation, all meals, snacks, beverages (including beer and wine with dinner), air or Nitrox fills, one 80 cu ft/12 liter tank, weights, weight belt, up to 4 dives per day on 5.5 days, 3 land excursions, service of Dive Guides, all other Galapagos Sky services and amenities. • Gratuities to guides and crew. A little Galapagos Penguin checks out our group. This trip will sell out, and soon. Do not wait, get me a deposit ($1500) ASAP for this trip of a lifetime. Drop me an email to get more info and ask any questions that you have. See you in the enchanted Galapagos Islands! A sea lion on the surface, about to come back down to play. She'll be waiting for you in December! When something unexpected happens, the best camera in the world is the one close by that is ready to shoot. I've learned that lesson several times while cruising in the Bahamas on our small sailboat. This is the story (and pics, of course) of one of those occasions. Atlantic Spotted Dolphins, Bimini, Bahamas. Early in our trip, we had the boat safely tucked into an anchorage in North Bimini. The wind had been howling for a week, and we were ready to get out of the boat and into the beautiful azure water. Finally, a weak cold front stalled out just in the right spot, and the wind stopped for a day. We headed out to the west side of the island, intent on doing some snorkeling and maybe finding a couple of conch for dinner. As we exited the channel, the ocean we saw was vastly different than what we saw a week earlier. There was not a ripple on the water, save for our very small bow wave. We made a turn to starboard and headed north. After motoring for about 20 minutes, I saw some different ripples on the water. Seeing the dorsal plus the curved back, I knew immediately that it was dolphins. Rima was down in the salon; I yelled down for her to grab her mask and snorkel, now. She'd never been in the water with wild dolphins, and it was high on her list of things she wanted to do. Dolphins chasing the boat in the morning sun rays. Two considerations popped into my brain at that point. First, I wanted to make sure I gave the dolphins some space. I did not want to drop right on them. They are curious animals, and if they want to approach us while we're in the water, it is their choice. I'm not going to chase them, and if they have better things to do (feeding, fighting, or, um, reproduction), so be it. Second, I wanted to make sure that these were the smaller Atlantic Spotted dolphins, not the bigger bottlenose. I might have been more hesitant to put Rima in the water with bottlenose. Ok, well, probably only a slight hesitation. Of course, we do not touch or otherwise harass these beautiful creatures. Atlantic Spotted Dolhins following our sailboat. Note the little baby at the lower right. He wanted to play, but mom kept him close at hand. There were about 20 dolphins in the pod, including a baby that was maybe 20 inches long. It was a joy to see them in the water. Rima found that when she clapped her hands, the dolphins, especially the younger ones, reacted as it she were a friend to play with. That lasted for several minutes, but they eventually decided that game was getting boring. So we switched, and I got in with my camera, a Canon 7D Mark II in a Nauticam housing, with a Canon 8-15mm behind a Zen DP-100. Fortunately, it was both close by and ready to go. I had strobes attached but was able to very quickly get them off, thanks to the fiber optic cables. We switched one more time, and I shot a little video from the deck of the boat. In this case, the camera that was close by and ready to go (with the added requirement of being able to easily shoot one handed while the other hand was on the steering wheel) was my iPhone. The pod of dolphins following along with the boat. Note the one just aft of the rudder who popped up to say hello to Rima. Shooting tip: I'd suggest not using (or bringing) strobes for an encounter like this for a few reasons. First, it's better for the dolphins, and I think they will be less likely to scatter when you start shooting. Second, your strobes will have a hard time reaching out far enough, and then you are left with a lot of color imbalance. If you need to do a lot of swimming, you will also appreciate not pushing as much gear through the water. Shooting ambient like this has its advantages, too. Without being tied to a strobe sync, you are now free to use whatever shutter speed you want. The results usually look more natural than with the strobes. Plus, if you are using a mirrorless camera, for example, you are seeing the actual exposure through the LCD; truly WYSIWYG. I like to take a quick custom white balance when shooting ambient. If shooting raw you can always fix the color, but with some cameras and some post processing software you might not have enough range to fix it if starting too far off. Besides, it is nice to see good color on the camera LCD. This was my third time over the past 20 years that I was fortunate to be in the water with dolphins. I remember each of the 3 times with great fondness. Chris Parsons and his partner Rima live on their sailboat, enjoying the 70% of the planet not covered up by land. The boat is currently in the Turks and Caicos. Chris leads about 4 trips a year to great destinations; check them out at http://chrisparsons.net/trips. 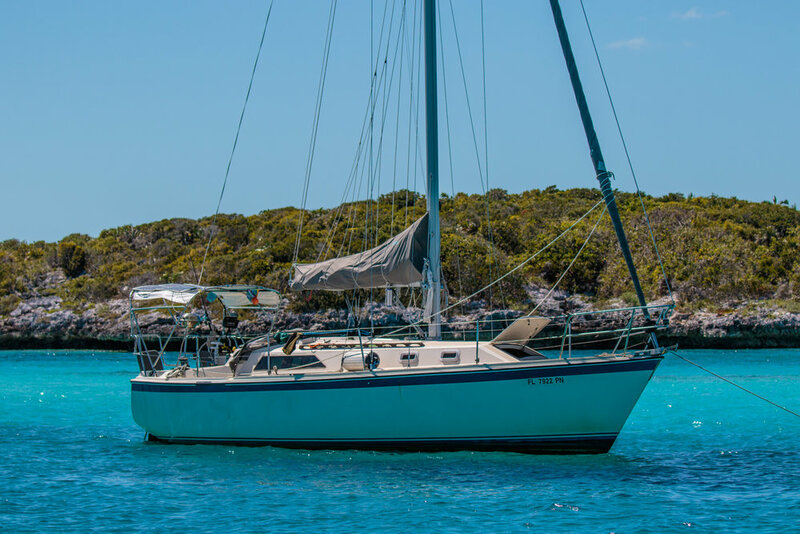 This O'Day 34 is cruise-ready and waiting for you in the beautiful Turks & Caicos. T&C is an ideal starting point for your cruising adventure, whether you take advantage of cruising here, head north towards the azure waters of the Bahamas, or south to The Virgin Islands and the rest of the Caribbean. If you like, we'll stay in Provo and take a few days to teach you the particulars of the boat. This boat is a great performer in light winds and a joy to sail. The sails and running rigging are in excellent shape, and it does not take much wind to get her moving well. The Universal diesel engine runs like a champ and can help out when the wind goes away completely or to maneuver onto a dock. Traveller has been well cared for and looks great for her age. My partner and I have been living on her for over 2 years now, and we keep after all of the maintenance needed. A water maker, 400 watts of solar with MPPT, life raft, dodger/bimini, and asymmetrical spinnaker are just some of the cruising necessities that this boat boasts. If you buy Traveller and want some help getting started, we will take a few days to help you do just that. We'll help you understand each system on the boat (e.g. sails and rigging, engine/transmission, watermaker, navigation/autopilot, solar/electrical). 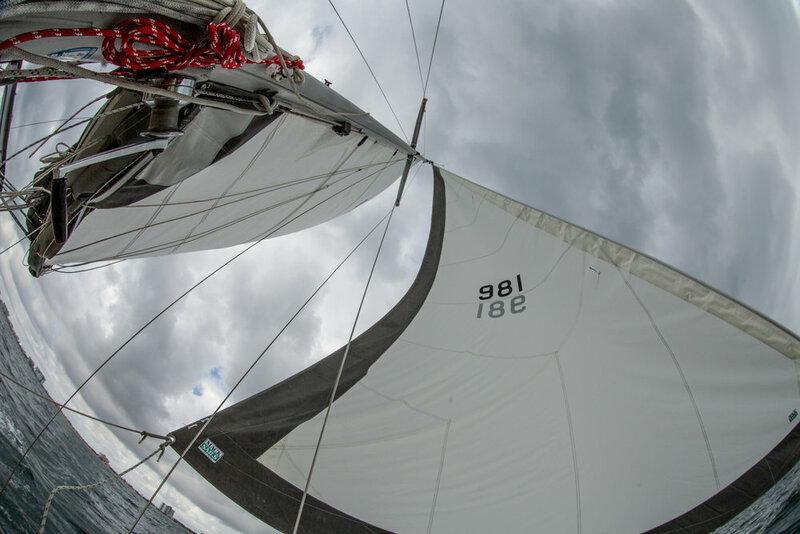 If you are newer to sailing, we'll go out and sail with you to get some practice with some of the basics like raising sails, tacking, reefing, running downwind or close-hauled. Our intent is that you will know the boat after a couple of days and be confident in starting your cruising adventure. Traveller is currently hauled in Turks and Caicos for hurricane season. We've un-stepped the mast and otherwise have her prepped in case a storm comes along. Once we're clear of hurricane season, we'll step the mast again and launch her. From there it is smooth sailing to your next destination of choice. See below for more details, or contact us if you have any questions. Do not miss out on this unique opportunity; drop us an email today!